JERUSALEM — Israeli archaeologists on Monday announced the discovery of the first known Roman-era theater in Jerusalem's Old City, a unique structure around 1,800 years old that abuts the Western Wall and may have been built during Roman Emperor Hadrian's reign. Jews consider the Temple Mount the holiest site on earth, while Muslims refer to the walled compound as the Noble Sanctuary and consider it the third holiest after Mecca and Medina. It was the site of two Jewish temples in antiquity — the second renovated and expanded by Herod — and today is home to the Al-Aqsa Mosque and Dome of the Rock. Joe Uziel, an Israel Antiquities Authority archaeologist heading the dig, said that the theater-like structure is believed to date to the second or third centuries — the period after Rome razed the city in 70 and the Emperor Hadrian rebuilt it in the mid-second century as a Roman colony, Aelia Capitolina. 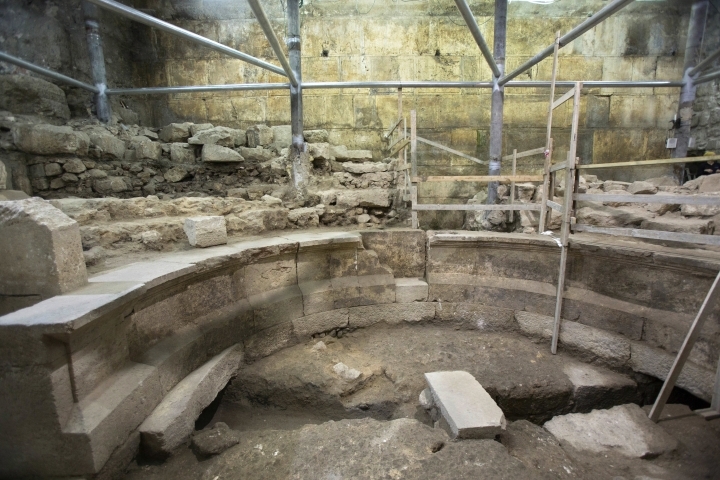 Ancient historical accounts mentioned the presence of theaters in Roman-era Jerusalem, but until now archaeologists had not found any of the structures. Uziel speculates that the unfinished semi-circular theater may have been intended to serve as a small odeon, a venue for musical or theatric performances, or a bouleuterion, a place of assembly for the colony's municipal officials. It was relatively small, and might have been designed to seat around 200 people. The excavations have exposed the first row of seats, orchestra area, and part of the stage. Wilson's Arch, part of a monumental causeway leading into the temple that soars above the theater, may have been employed for its acoustic properties. "One of the amazing things is that because we're beneath an arch, they would have had the arch to use as their roof," Uziel said. What remains unanswered is why the building wasn't finished. "After putting in all this effort of building such a grandiose building, what would cause them to stop," Uziel wondered and suggested that the outbreak of the second Jewish revolt against Rome, from 132-135, could have halted construction and left the theater unfinished. 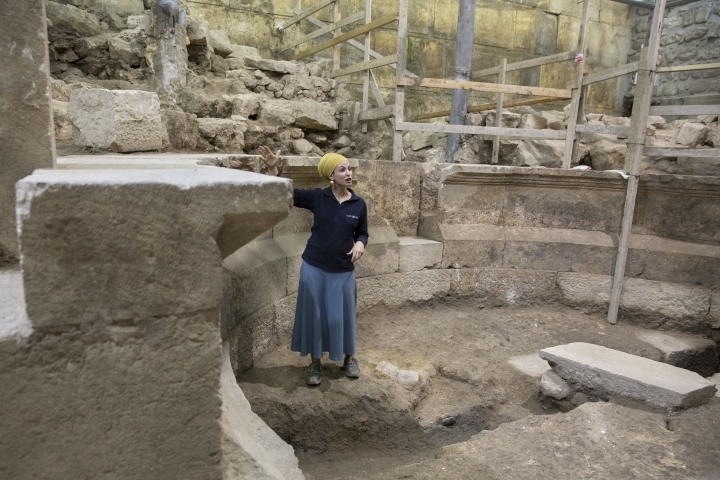 Zeev Weiss, a Roman archaeologist at the Hebrew University of Jerusalem who wasn't involved in the excavation, said the discovery of such a central civic building was "a great find." Most of the major public structures from Roman Jerusalem — the large theater, forum, basilica and bathhouse — remain undiscovered. "Hopefully one day those will be found as well," Weiss said. 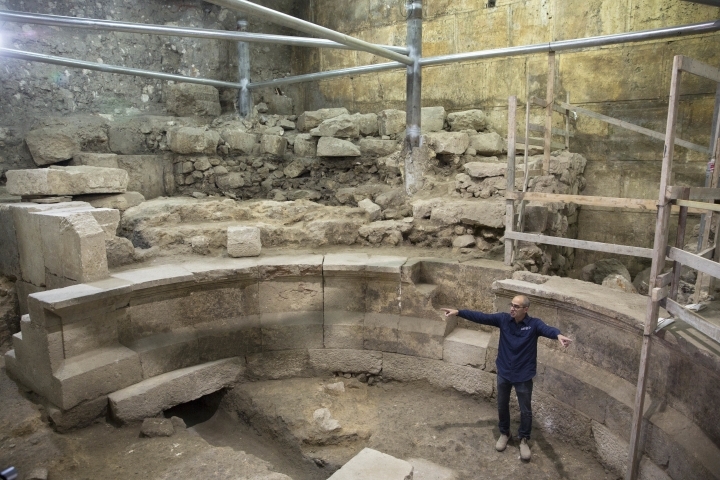 Uziel hopes further excavation of the theater will better inform scholars about daily life in Roman Jerusalem in the decades after Jerusalem and its temple were razed. "I believe that this is one of the indications that also during that period between the Second Temple and between the rise of Christianity, Jerusalem was also an important Roman colony, not just a wasteland, no-man's land where the legion sat around," he said.